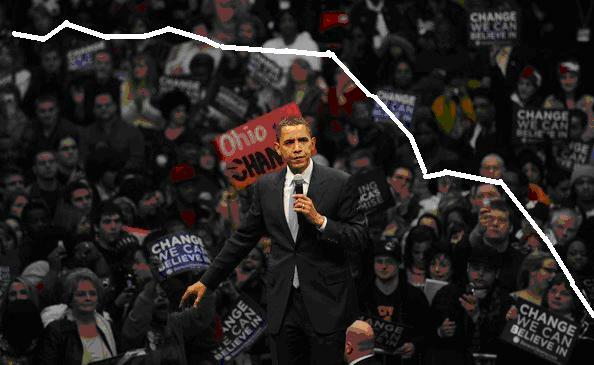 I heard the new populist version of President Obama at a Town Hall meeting in Ohio today. I remember this guy. Looks amazingly similar to a fellow I saw campaigning about a year and half ago. Just might work. He’s a very attractive candidate. One favor though, Mr. President. Is there any chance you could give these fiery anti-Wall Street speeches sometime after 4pm, ET? You see, everytime CNBC shows you talking about sticking it to the banks, those crazy guys on the floor of the New York stock exchange put in sell orders. Lots and lots of sell orders. The market has now lost 400 points in two days and it seems to coincide precisely to those moments you’re speaking live on cable TV. I love you, but you’re killing me, man. My 401K is taking a beating. Next passionate populist-guy town hall speech- 4:30pm. Please? No, seriously.